The vocabulary activities on this page are essential for child vocabulary development. These activities can be taught in the classroom (small and large group setting) and can also be implemented at home! When teaching vocabulary one of our goals is to make words visually come to life in our classrooms. We have space for furniture and equipment; we have space for books, backpacks, and writing utensils. If words are important, then finding places to organize and display words should also take prominence in the structure of your classroom. By intentionally creating space to display important vocabulary words in our classrooms, we send the message to kids that "Hey, words are important!" This message is especially important for our kids who come from underprivileged language environments. We always designated wall space for our vocabulary words. 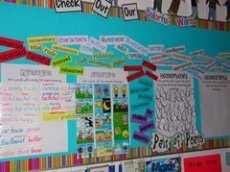 This is our "colorful words" wall where we highlight vibrant vocabulary, grade level content words and display the student work from some of the vocabulary activities we complete in our classroom. Our Wonder Words Template (enlarged) provides students the opportunity to place words they understand when they are reading. Students are provided with opportunities during the day to discuss their word with others as we try different strategies to figure it's meaning. One of our students' favorite vocabulary activities. Books for teaching vocabulary that contain "Colorful Words" are kept in a special place in the classroom. Books are reread throughout the year as we continue to find additional books with interesting words. Big Words for Little People by Jamie Lee Curtis and Sparkle and Spin by Ann and Paul Rand are great books to use at the beginning of the school year. Help children keep track of the interesting words they come across by having them create their own vocabulary dictionary! A page is dedicated for each letter of the alphabet...Simply have children write the word, write synonyms or the meaning of the word, and draw a visual association to help remember the word. Help children make connections between words while making predictions about the text. Before reading, pick a handful of words that children will encounter. Write these words (in order they are located in the book) under "Story Chain". Have them read the first two words and think how they are connected. Under "Story Prediction," have them write words or draw pictures to describe the connection. Next, have them connect the second and third word and write words or draw a picture to describe the connection. This continues until all of the words have been "connected". This is a great vocabulary AND comprehension activity! Choose a word that you will come across in a read aloud. Write that word in the left column. Have children draw a picture or write words to show what that word means to them before the reading. After you read, have the students draw a picture or write words if their meaning has changed. (This vocabulary activity is helpful to use when the comprehension strategy "mental image" is introduced). The New Word Grid allows students to make personal connections with words. It appeals to visual learning styles and allows students to organize their thinking and relate to words in a personal way. When teaching vocabulary, explain to your child, "Words are important to me and you will understand soon how important they are to you. 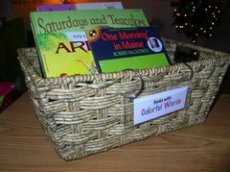 Because we feel this way, we are going to spend time focusing on words and the connections between words and our reading." Use the following template for your child to draw or write their connections they make with words. Children enjoy sharing their personal connections to words, but they also need to know how a word fits into the world. Place a vocabulary word you are focusing on and have children think about what it might mean to someone else. (Children enjoy discussing what a word would mean to fictional characters and school staff members. This vocabulary activity works best when used on an overhead transparency to generate whole-group conversation). 'Schema" is one of the first words we learn about at the beginning of the school year. It is all of the things that you know in your brain. Everyone has schema, although everyone's schema is different. Using the above document, have children draw a picture or write words in the light bulb about their schema for a particular word. This vocabulary activity can even create some interesting discussions in the classroom! Authors like Dr. Seuss and Roald Dahl create "silly" words that sound appealing to children. Their meanings can be figured out in context even though they are not real words. 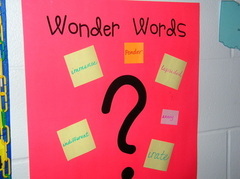 These "un-words" are kept in a special binder that students can add to when they come across them in print. A fun vocabulary activity for working with words! 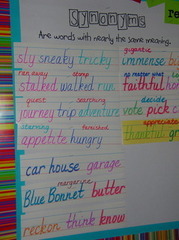 This word bank focuses on word structures (synonyms) created by the teacher and student. Vocabulary activities that teach not only referential vocabulary (what words mean) but also relational vocabulary (how words relate to each other) are essential to supporting reading comprehension and making connections in general. Click the above link to see a list of common synonyms! Vocabulary activities can help children when they are reading and when they are writing! Enlarge the above template and laminate. Display in a prominent area of the classroom. When children come across new words in print, place in the "dollar" column. Work backwards and help them generate words that mean about the same, but might be not as interesting as the "dollar" word. (The "penny" and "dime" words help children make connections between the synonyms and help them remember the meaning of the "dollar" words). This is also a helpful vocabulary activity when children are writing, place one of their words in the "penny" column and add more interesting words to the "dime" and "dollar" column. Two templates are attached for printing. Enlarge this template and use with "Words Worth Chart" (above). 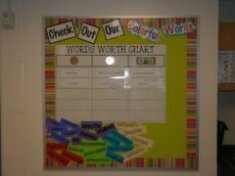 Once the Words Worth Chart is full, take off the "penny" and "dime" words and place them in the trash! Once words are in the trash, students are encouraged to use the "dollar" words when they are speaking and writing. This is one of the first vocabulary activities we teach at the beginning of the school year. Begin by collecting bags of crayons that contain various shades of a specific color (Ex. Red: Red-Orange, Hot Magenta, Mahogany, Razzmatazz, Maroon, & Red-Violet). On a large chart paper write a word students can easily generate synonyms for, like "happy". Write the word and color over it with a red crayon. Have students think of other words that mean about the same thing as the word "happy". Write them down and shade over each word with a different shade of red. This activity helps children understand that synonyms are words that mean about the same thing but have different meanings and spellings; just like there are various shades of crayons. Using the above template, students can come up with synonyms for a word while coloring each crayon a different shade of a color. This vocabulary activity (best used in November) helps students generate synonyms for a specific word with their families. When the list is returned to school, students place their original word on the body of the turkey and write the synonyms on each feather. Have children share their new words with classmates and display them in the room! Scroll down for "Antonym Turkeys". This word bank focuses on word structures (antonyms) created by the teacher and student. Click the second link to see a list of common antonyms! By enlarging the above template, you can create a fun rhyming antonym chant that students enjoy singing and reading through out the school year. Laminate and cut out the following antonym cards. 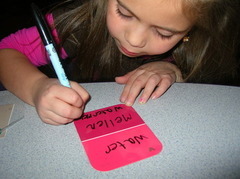 Have students work in small groups to find word matches. Three different antonym levels are provided on the above template. Once synonyms and antonyms have been introduced, this template is used to help us see the connections between words as well as figuring out the meaning of new words. Keep this template close to where you read aloud to your children. Place a "new word" in the box at the top. Have students draw pictures or write words or phrases to give examples (synonyms) of that words and non-examples (antonyms) for that word. This vocabulary activity (best used in November) helps students generate antonyms for a specific word with their families. When the list is returned to school, students place their original word on the body of the turkey and write the antonyms on each feather. Have children share their new words with classmates and display them in the room! This word bank focuses on word structures (homophones) created by the teacher and student. Click the above link to see a list of common homophones! After students understand that homophones are words that sound the same but have different meanings and spellings, have them try to generate a list of homophones at home with their families. When lists are returned to school, encourage students to share them with the class! 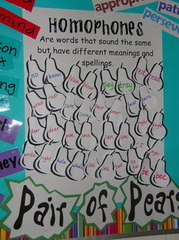 The above template can be used to write pairs of homophones on the pairs. It can also be used to display homophones that are generated by the teacher and the students (as shown on the above picture). 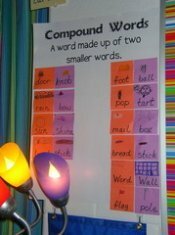 This word bank focuses on word structures (compound words) created by the teacher and student. By keeping a supply of laminated paint samples, students can easily practice writing and reading compound words they come across in print. This makes for effective vocabulary activities to keep at the writing center! Have students look at the compound word addition sentences. Ask them to draw (or write) the missing picture in the empty box. See if they can also generate two new compound words on their own! 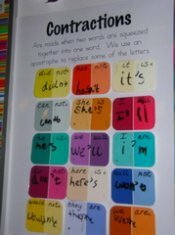 This word bank focuses on word structures (contractions )created by the teacher and student. Visit your local Home Depot or Lowe store to grab some paint swatches. This vocabulary activity is an easy way to bring words to life visually in your classroom. Click the above link to see a list of contractions! The following vocabulary teaching tool is a helpful reference for students when they are learning how to read and write common contractions. By looking at the second word, students can locate the rule for that contraction easily! Using the words at the bottom of the document, have students randomly fill in the blank squares. An adult calls out the contraction and the student colors in that square if they have its match. The winner is the first person to get five in a row! Our students love this vocabulary activity! Help children understand and recognize common prefixes and suffixes by cutting out and laminating the above cards. Provide children with opportunities to locate these in words. This is a great tool to use when helping children understand prefixes, root words, and suffixes! By laminating the first page, you can write root words and teach children that a root word is just like the root of a plant...The root word will stay put when prefixes and suffixes are added to it! These charts can really help children when they are learning the rules for the endings -s, -ed, and -ing. This document displays some of the most common prefixes and suffixes. By helping children understand the meaning of prefixes and suffixes, they can figure out the meaning of unknown words when they are reading. Purchase a checkers board (Wal-Mart) and place velcro on the black squares on the game board. Print, laminate, and cut on the following squares on the above template and place corresponding velcro pieces on the back. Place the words with prefixes and suffixes in random order on the game board. 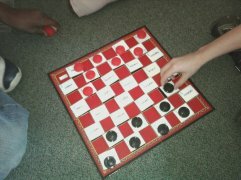 Each time a player moves a checker they must say the prefix or suffix, read the word, and explain what it means. (The template "Common Prefixes/Suffixes" from above can help children as they are playing this game).